The space between (us) features the collaboration of interdisciplinary artist/sculptor Lisa Dillin and choreographer/artistic director of Deep Vision Dance Company Nicole Martinell. Stimulating dialog around an individual’s freedom of expression, The space between (us) speaks to social isolation, barriers to social connection, and disconnection to the places we move through and inhabit common for individuals residing in the built environment due to architectural control of the body, social norms that discourage social interaction, social “uprooting” due to migration, and the increasing level of mediated social interaction that takes place through online communications. During three performances, as well as the subsequent video displays that function as a placeholder for dance, the architectural objects on view become activated spaces, separating while displaying bodies in motion and illustrating life in contemporary culture. 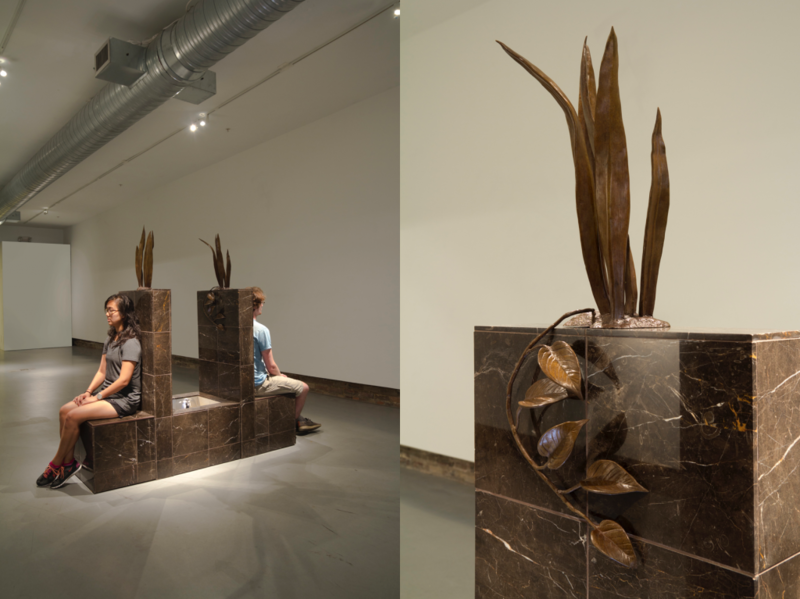 About the artists: Lisa Dillin is a Baltimore-based artist working in sculpture and participatory art practices. Her work stems from an interest in the individual human experience within the built environment, forming a comparison with our common ancestral relationships with nature. Dillin earned her B.F.A. in photography from Atlanta College of Art in 1998 and her M.F.A. in sculpture from Cranbrook Academy of Art in 2006. Her work has been selected for exhibition at various venues including the Baltimore Museum of Art and The Contemporary Museum in Baltimore, Maryland; Hamiltonian Gallery and Washington Project for the Arts, in Washington, D.C.; Vox Populi and Practice Gallery in Philadelphia, Pennsylvania; and Nurture Art and Transmitter in Brooklyn, New York, New York. Art fairs include the Select Art Fair in New York City, Aqua Art Fair and Artist-Run Art Fair in Miami, Florida. Dillin was a 2012 Sondheim Prize Finalist, and 2014 and 2017 Maryland State Arts Council Individual Artist award recipient and the Project Director for the CHM Sculpture Park and Fellowship Program during 2017. Nicole A. Martinell is a choreographer, dancer, teacher, and founder/artistic director of Deep Vision Dance Company. From grand site works to intimate spaces, Martinell’s choreography questions the complexity of humankind and explores the strange, mysterious beauty of the world around us. Accolades include 20 original works, 10 productions, a multi-city tour, Maryland’s Baker Artist Award, selection for Annual Choreographers’ Showcase (MD), American College Dance Association Conference Galas (VA, MD), Capital Fringe Festival (DC), Exchange Choreography Festival (OK), ECOPOETIC (NY), Intersections Festival (DC), and New Release Choreographers Showcase (DC). Noted community projects include Learning Physics through Movement arts integration program and AKIMBO Dance & Movement Art Festival – an interdisciplinary, site-specific festival in Baltimore City. Martinell received an MFA in Dance from Texas Woman’s University and is on faculty at Towson University.